Photonfocus AG has recently released the MV-D1024E-3D01 camera which is optimised for 3D profiling using laser triangulation and the advantageous peak detector algorithm. Photonfocus AG, Switzerland, has recently released the MV-D1024E-3D01 camera which is optimised for 3D profiling using laser triangulation. The MV-D1024E-3D01 camera contains an image pre-processing module that specifically detects laser lines and locates the central axis of the laser line in 3D using triangulation. 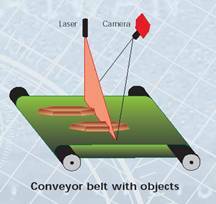 This enables the 3D profile of an object to be measured by the camera. Users do not need to process the image or perform any additional calculations on the computer leaving it free to do other tasks and therefore accelerating the process. The MV-D1024E-3D01 uses a new algorithm which provides much higher accuracy than commonly used Centre of gravity (COG) techniques. The new algorithm is impartial to different surface textures and light conditions. Using the Peak Detector algorithm the camera can resolve up to 1/64th of a pixel which is considerably better than 1/10th of pixel typically offered by COG. Photonfocus use the new Peak Detector algorithm from AQSENSE in combination of their patented LinLog technology which enables precise measurement in extremely varied light conditions. The LinLog technology prevents an overexposure (saturation) of the sensor while maintaining good grey scale information in darker areas. In this way sub-pixel information in the image signal is maintained even under situations where for example there may be strong reflection from surfaces that are being examined. This offers significant advantages in all situations but especially when scanning metallic, translucent surfaces, organic fabrics or textiles. LinLog stands for the Linear logarithmic characteristic curve of Photonfocus CMOS sensors. It offers a very high dynamic range of up to 120dB which is significantly higher than the 60dB of the best linear sensors. LinLog allows simultaneous acquisition of surface (2D – grey scale) and height (3D – Laser triangulation) inspection. The key surface is inspected in the linear region while the 3D triangulation is done in the logarithmic range. The camera features a monochrome Photonfocus A1024B CMOS Sensor with 1024 x 1024 pixel resolution. The bit depth can be set to 8, 10 or 12 bit and a Camera Link interface allows for fast transfer of data. The MV-D1024E-3D01 is capable of up to 110 frames per second at full resolution. In most cases however when profiling an object the aspect ratio of the image need not be one to one. Therefore the camera can be run at a lower aspect ratio with its ROI mode and so run at much higher frame rates. For example when run at 1024×128 pixels the camera can run at 980fps. The MV-D1024E-3D01 is ideal for 3D applications such as 3D profiling for quality control, PCB inspection, food inspection, packaging inspection, and much more.